today’s health system is woefully broken. And that the people who experience it are frustrated by its needless complexity, unpredictability, and lack of transparency. the source of the problem is the healthcare system itself. the solution requires working from within the system to bring human-centered design into the core. the solution lies not in incremental fixes to this broken system, but in setting aside the status quo to find a new way forward. the solution lies in deeply understanding and designing for the needs of people, because they are the system. healthcare wasn’t intentionally designed. 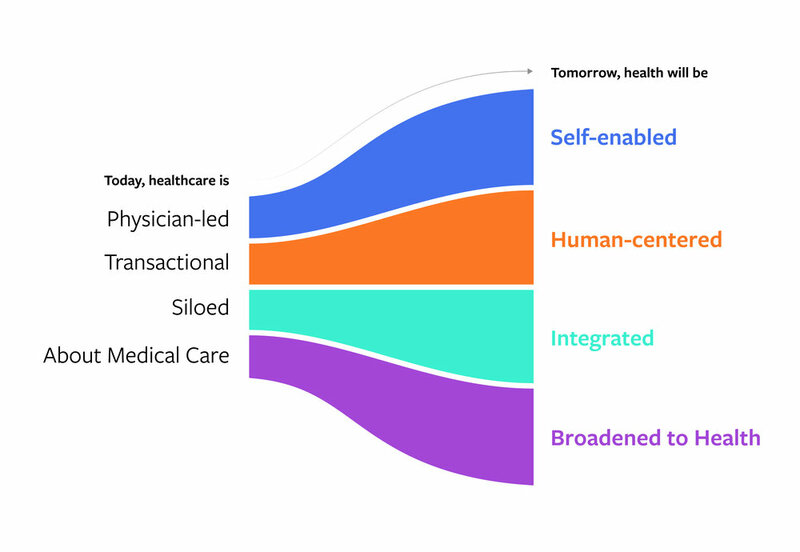 There are four specific shifts within the health revolution where design has an explicit role in realizing a profoundly better outcome. These four trajectories focus our work and guide our mission/s. We are here to realize change. We bring specific capabilities and a specific point of view about how and where design can be applied to create impact.